I have an informal policy that I try not to make recipes more than once. I'm so overwhelmed by the sheer volume of ridiculously good-sounding recipes online and in my ever-expanding cookbook collection, so unless a recipe is the best I've ever tried, I move on to the next. 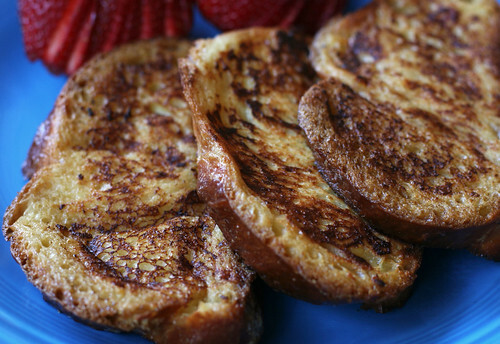 This French toast is, without a doubt, the best I've ever tried. At home or in a restaurant. It didn't hurt that it was made with the challah that I had so lovingly spent the whole day before making. But still. This is a forever keeper kind of recipe, the kind that I'll make again and again. The perfect textural balance of custardy and crisp is what sold me, though the flavor and ease of preparation earn bonus points here too. Even though there are multiple steps that happen in quick succession, the fast pace of the recipe means that the French toast enters your mouth sooner. That's what I'm talkin' about. Thanks to Anne, who is always ready with an Earth-shatteringly good recipe recommendation in my times of need! 1. Preheat oven to 375 degrees F. In medium mixing bowl, whisk together the half-and-half or milk, eggs, honey, and salt. You may do this the night before. When ready to cook, pour custard mixture into a pie pan or shallow dish. 2. Dip bread into mixture, allow to soak for 30 seconds on each side, and then remove to a cooling rack that is sitting on a sheet pan, and allow to sit for 1 to 2 minutes. 3. Over medium-low heat, melt 1 tablespoon of butter in a 10-inch nonstick saute pan. Place 2 slices of bread at a time into the pan and cook until golden brown, approximately 2 to 3 minutes per side. Remove from pan and place on rack in oven for 5 minutes. Repeat with all 8 slices. Serve immediately with maple syrup, whipped cream or fruit. 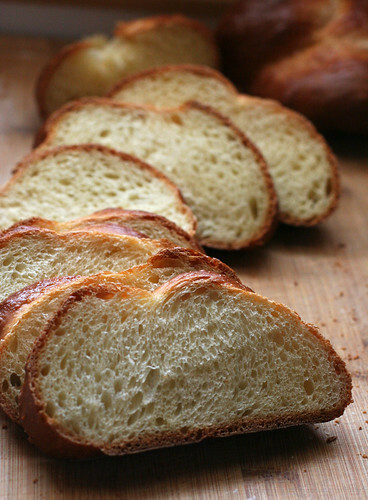 I've never thought to add honey to french toast batter--brilliant, and a perfect pair with challah. I can't wait to try this! Oh my! This one is delicious! I have been craving for this. So busy I can't even fry an egg. i can't think of a finer use for your challah, amy!